Collaboration among social actors (government, businesses, civil society organisations, consumers’ representatives) is a core element to succeed in the transition to a sustainable society. 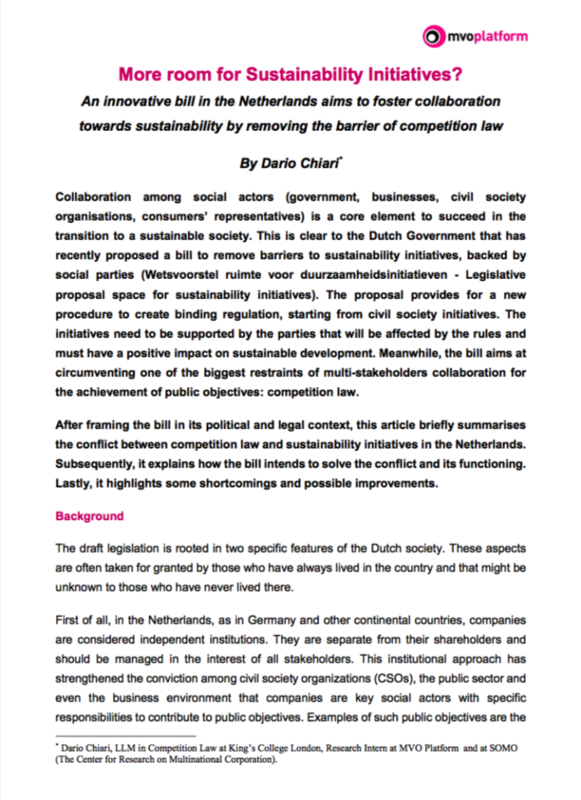 This is clear to the Dutch Government that has recently proposed a bill to remove barriers to sustainability initiatives, backed by social parties (Wetsvoorstel ruimte voor duurzaamheidsinitiatieven – Legislative proposal space for sustainability initiatives). The proposal provides for a new procedure to create binding regulation, starting from civil society initiatives. The initiatives need to be supported by the parties that will be affected by the rules and must have a positive impact on sustainable development. Meanwhile, the bill aims at circumventing one of the biggest restraints of multi-stakeholders collaboration for the achievement of public objectives: competition law. The draft legislation is rooted in two specific features of the Dutch society. These aspects are often taken for granted by those who have always lived in the country and that might be unknown to those who have never lived there. First of all, in the Netherlands, as in Germany and other continental countries, companies are considered independent institutions. They are separate from their shareholders and should be managed in the interest of all stakeholders. 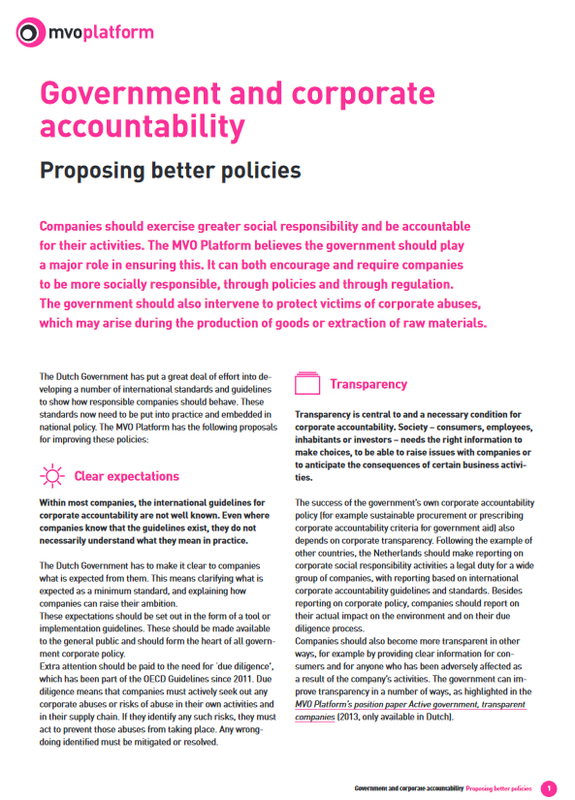 This institutional approach has strengthened the conviction among civil society organizations (CSOs), the public sector and even the business environment that companies are key social actors with specific responsibilities to contribute to public objectives. Examples of such public objectives are the respect for human rights, the creation of an inclusive society, and the pursuit of the Sustainable Development Goals. This cultural and legal characteristic is the underlying premise of the legislative proposal: if companies were not expected to collaborate and contribute to public objectives in the first place, this bill would become meaningless. This belief is so strong that the government expects companies to participate and show their support to initiatives that will create additional rules and will impose higher standards of conduct. Secondly, the bill follows a long-lasting tradition of consensus decision making, usually referred as the ‘Polder model’. 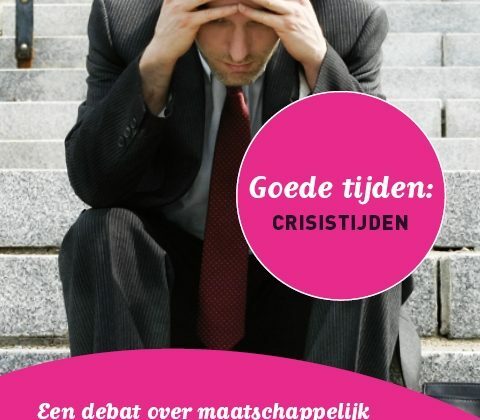 The Polder model characterised Dutch politics for most of the 80s and 90s and consists of a consensual bottom-up decision making process originally based on a tri-partite cooperation between employers’ organizations, trade unions, and the government. In this case, binding regulations are put in place by the competent minister, when the private parties that will be affected by the rules ask for them or show their support. In addition, the proposal addresses some of the limits of self-regulation, which has been the mantra of the last decades in the Netherlands. Generally, competition law (article 101 of the Treaty on the Functioning of the European Union (TFEU) and Article 6 of the Mededingingswet in the Netherlands) has the objective to maintain market competition by regulating anti-competitive conduct by companies. An easy example of anti-competitive conduct is a cartel between companies to raise the price of products to the detriment of consumers. Competition law can result in an obstacle for sustainability initiatives if its interpretation is narrowed down to the point that it becomes solely an instrument aimed at enhancing economic efficiency and lowering prices for consumers. Initiatives that contribute to public objectives such as environmental protection and respect for human rights, but that don’t lower prices or even raise prices, may run into trouble with authorities enforcing competition law. In recent years, the Netherlands has experienced first-hand the limits of such an interpretation of competition law. In 2013 an agreement between the Dutch Government, employers’ organizations, trade unions, and civil society organizations planned the coordinated closure of five coal plants to switch to renewable energy (Energy Agreement for Sustainable Growth). When asked its opinion, the Dutch Competition Authority (ACM) declared the agreement incompatible with competition law, since the closure of the plants would have caused an increase in energy prices for consumers. Just two years later, a sustainability initiative among supermarkets, poultry slaughterhouses and poultry farmers to raise animal welfare (‘Chicken of Tomorrow’ case) was prohibited by the ACM on the basis that the agreement would have benefited the animals, but not the final consumers, who would have suffered a higher price. Competition law became an issue also in the implementation of the Dutch National Action Plan, which implements the United Nations Guiding Principles on Business and Human Rights (UNGPs). The UNGPs are based on three pillars: the state duty to protect human rights, the corporate responsibility to respect them and the access to effective legal remedies in case these rights are violated. 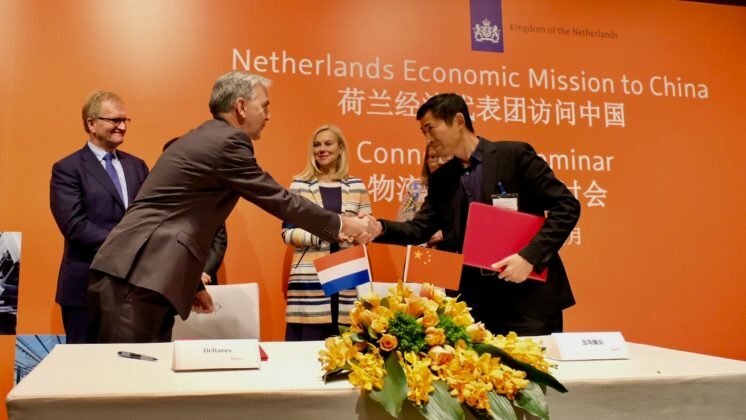 The Dutch government has committed to implement the principles through sectoral agreements between public institutions, companies, and NGOs. These agreements would strengthen the social responsibility of enterprises in the sector in which they operate and provide joint solutions to problems that individual companies cannot entirely solve individually. Some agreements have already been concluded, for instance in the textile and the financial sectors, while others are on their way. During the conclusion of the textile agreements, companies perceived competition law as a major obstacle. An agreement among companies to raise wages in production countries, could have been considered a restriction of competition, resulting in fines for participants by the European Commission or by the ACM. The Dutch government has already tried to mitigate the conflict with competition law in 2014, by issuing policy rules incentivizing the ACM to consider the long-term benefit for consumers when analyzing cases involving sustainability initiatives. However, the new policy rules were unable to exempt the previously mentioned Chicken of Tomorrow Case. Following this failure, the Minister of the Economy has tried to issue new and more substantial innovations, like the possibility to consider the effects of the agreement not only to the final consumers, but also on society as a whole. However, these new rules never came into effect by the strong opposition of the ACM and especially of the European Commission. How is the bill solving this conflict and other problems? Competition law applies as long as there is an agreement between private parties that (might) restrict competition. The bill intends to solve the problem by putting a sustainability initiative into general binding rules (ministerial regulation), so that every market player is bound by it and competition law does not apply anymore since there is no agreement any longer. At the same time, the legislative proposal has the potential to solve other challenging problems connected to voluntary and sustainability initiatives Firstly, it can solve coordination problems. To be successful an initiative needs to be coordinated which is time-consuming and expensive. To tackle this issue, companies often rely on industry or trade organizations. However, these are not present in all sectors, might only represent a small percentage of companies, and usually do not exist in case of vertical coordination; such as agreements between companies of the same supply chain or between companies and CSOs. Secondly, the bill could also resolve “first mover disadvantages” and the “free rider” issues, by binding all market players to the same commitment and effort. Companies will no longer be able to shirk sustainability initiatives arguing that by being the first on the market, they would suffer higher costs and lose market shares. At the same time, companies should be reassured by the fact that no one will be able to take advantage of the initiative without investing in it: everyone is bound by the same regulatory framework. How would the system work? The bill sets out four phases to transpose sustainability initiatives into binding rules: a submission, a review, an advice and consultation, and a decision phase. Given that the ultimate scope of the bill is the elimination of barriers to sustainability initiatives, the first point to make is that only initiatives that will come from society and are supported by private parties will be transposed into binding regulations. The Minister will assess the request and, if compatible with the requirements explained below, will convert it into binding rules. However, under no circumstances, the Government could use this procedure to adopt regulations that have not been proposed by private parties. A proposal can be submitted both by enterprises, trade organizations, CSOs or even individual citizens. However, in any case, the proposal should be supported by the parties that will be affected by the binding rules. The draft law does not specify exactly how to measure the support. Nonetheless, the explanatory memorandum (Memorie van Toelichting) published by the Government sets out several useful criteria. Firstly, consumers support should be always present, since it is likely that the rules will affect price or product characteristics. In addition to consumers, the business sector should show its support for the initiative, especially when the binding rules will have specific consequences on their economic activities. Thirdly, the memorandum refers to CSOs, whose support is essential to establish whether the initiative effectively improves the interest that they represent. The proposal needs to include two additional elements to be submitted: the contribution that private parties are ready to provide regarding monitoring and enforcement of the rules, and an impact assessment of the initiative on sustainable development, on the market, and on other policy fields. Private parties need to demonstrate how the proposal actually contributes to the objective of sustainable development, while having a marginal effect on the market and on other policy areas. Once the proposal has been submitted, the Minister of the relevant policy area will conduct an assessment in order to decide whether the initiative will be transposed into binding rules. After having ascertained that the initiative is not in conflict with international, European and national law, and that the initiative does not fall within one of the subjects that the Constitution clearly reserves to the law, the Minister shall verify the support to the initiative and its feasibility. The scope of the advisory phase is to provide the Minister with objective and accurate information. The Minister has an obligation to ask the ACM to issue an opinion on the market effect of the proposal. The ACM shall not balance the positive and negative effects of the proposal, but rather limit its analysis to the market effects. In addition to the ACM, the Minister can decide to consult other institutions, such as the Netherlands Environmental Assessment Agency (Planbureau voor de Leefomgeving). If after receiving the advice the Minister is convinced of the desirability of the sustainability initiative, he/she has to publish it in the Official Journal so that anyone is able to express his opinion, observation or criticisms. This represents an opportunity for those who did not support the initiative in the first instance to raise their concern and observations. At the end of the consultation procedure, the Minister is required to weigh positive and negative effects on the basis of the data provided by the parties and through the advisory and consultation procedure. 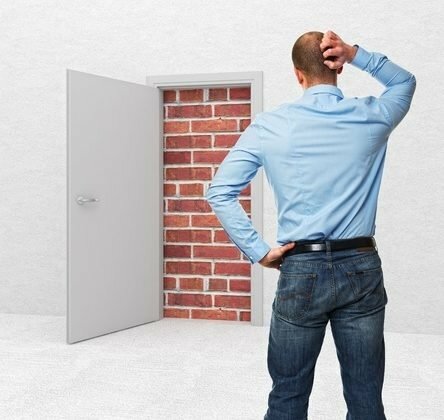 The Minister decides whether the initiative should be included in a ministerial order and is not bound by the initial version of the initiative: the final outcome might differ from the original version due to the advice and consultation procedure or because of the assessment of the Minister. If the rules consistently differ from the ones proposed, the Minister is expected to consult the parties that submitted the initiative. The order can come into force at the earliest four weeks after the decision of the Minister has been made and, only after it has been submitted to the Chamber and the Senate for parliamentary control and suggestions. The Minister has the possibility to grant an exemption to those parties who contribute to sustainable development in a different way or through a different scheme, if they are able to demonstrate that they contribute more, or at least in an equivalent way. The memorandum explains this possibility on the basis that the bill wants to give space and not restraint alternative solutions. 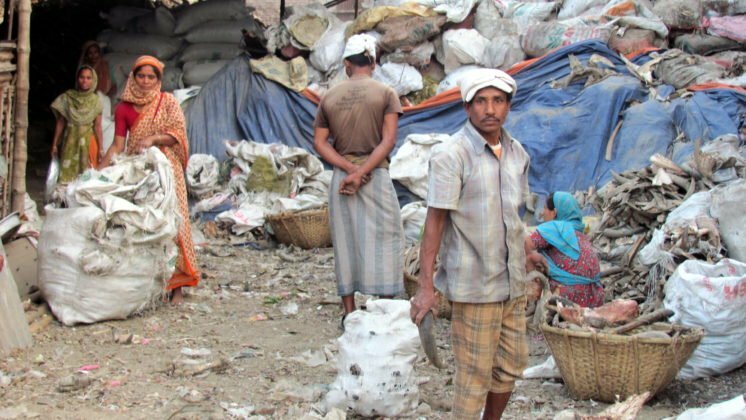 However, it remains unclear how it will be possible to evaluate whether another initiative contributes as much as the binding one to sustainable development. Eventually, a monitoring system has to be established by the Minister in collaboration with the private parties supporting the initiative in the first instance. An example provided by the memorandum is a label, which private parties might already have in place and that becomes mandatory for all the operators in the market. Nonetheless, the enforcement of the rules will remain a Ministerial task. An administrative fine of up to € 82.000 could be imposed on those parties that violate the rules. However, ‘all that glisters is not gold’! Firstly binding regulations will be tied to private initiative and support. While there is a growing consensus on the social and environmental responsibilities of companies in the Netherlands, one should not forget the reluctance of enterprises for binding rules. It is one thing to make self-regulation agreements between private parties, under their control and discretion, but another to initiate and support a procedure that will create public general binding rules, under government control and enforcement. This bill represents an opportunity for the business sector to walk the talk. Moreover, the support should not come only from the enterprise world, but also by consumers and CSOs. Finding a balance between the different interests and expectations will constitute one of the biggest challenges. Albeit the bill has been presented as a final solution to the long-lasting conflict between sustainability initiative and competition law, some concerns still endure. It is true that both Dutch and European Competition law explicitly prohibit agreements and concerted practices among private parties and do not refer to public regulation. However, the case law of the European Court of Justice (ECJ) has established that Member States cannot undermine the proper functioning of the internal market by rendering ineffective the competition rules applicable to undertakings. This is usually referred as the “useful effect doctrine or the effet utile principle”, which was created by the simultaneous application of the loyal cooperation obligation (article 4(3) of the Treaty on the European Union) and the prohibition of anti-competitive agreements ( article 101 TFEU). Without entering into details, the useful effect doctrine creates three obligations on Member States. 1) They should refrain from requiring or encouraging the adoption of agreement contrary to 101 TFEU; 2) they should not reinforce the effects of these agreements, and 3) should refrain from delegating to private economic operators responsibility for taking decisions affecting the economic sphere. The second obligation is particularly relevant for this bill. Putting “initiatives” supported by private parties into general binding rules shares many similarities with “reinforce the effect of the agreements”. The memorandum easily solves the issue by holding that the initiative is a request for binding rules and not an agreement. However, it is important to point out that article 101 TFEU does not only refers to agreements, but also decisions and concerted practices. Moreover, the terms are interpreted very broadly, so that an agreement can be oral or can also express just an intention for the future to be caught by article 101. It is not possible to prevent a priori that the European Commission or the ECJ will consider this law a violation of the principle of sincere cooperation. Even more important, it is highly likely that an enterprise that does not wish to be bound by the new rules created following this procedure, will start a legal action to refer the issue to the ECJ. Eventually, as pointed out by the MVO Platform in its response to the open consultation, the bill still needs to address two important issues. Primarily, the mechanism should be available for all initiatives including those that tackle social aspects and not only environmental ones. For this reason, the MVO Platform suggests to explicitly mention the following standards as a point of reference in the explanatory memorandum: OECD guidelines for multinational companies, the UN Guiding Principles on Business and Human Rights (UNGPs) and the ILO Declaration on Social Justice for a Fair Globalization. Secondly, the bill should lead to the creation of higher standards of conduct among market players. Currently not enough emphasis is put in the bill and in the memorandum regarding this aspect. It is clear that binding rules will be created only when the initiative is backed with sufficient support. Support has to be expressed by different stakeholders and this entails compromise, which is often a synonym of lower standards. The procedure should ensure that the initiatives at least meet the standards of international agreements, treaties and guidelines ratified by the Netherlands or to which it has committed itself. In no circumstances, an initiative that proposes a lower standard of conduct should be transposed into binding regulation. * Dario Chiari, LLM in Competition Law at King’s College London, Research Intern at MVO Platform and at SOMO (The Center for Research on Multinational Corporation).